Mitochondrial cytochrome bc1. The membrane is shown schematically in gray. Cells are masters at squeezing every drop of energy out of their food. They disassemble the molecules in food atom by atom, driving a variety of unusual energy transformations in the process. At the end, all of the hydrogen atoms have been separated from the food molecules and are used to turn the rotary motor of ATP synthase. To do this, the electrons are stripped from these hydrogen atoms and used to power huge protein pumps that transport protons across a membrane. These protons then power the rotation of ATP synthase as they return to their original positions. 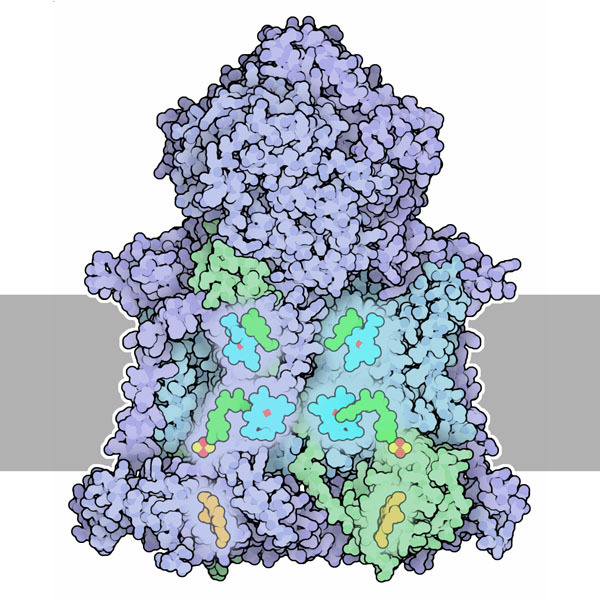 Cytochrome bc1 is the central pump in this process. It binds to ubiquinol, a carrier of hydrogen atoms that is found in the mitochondrial membrane, and removes two protons and two electrons. 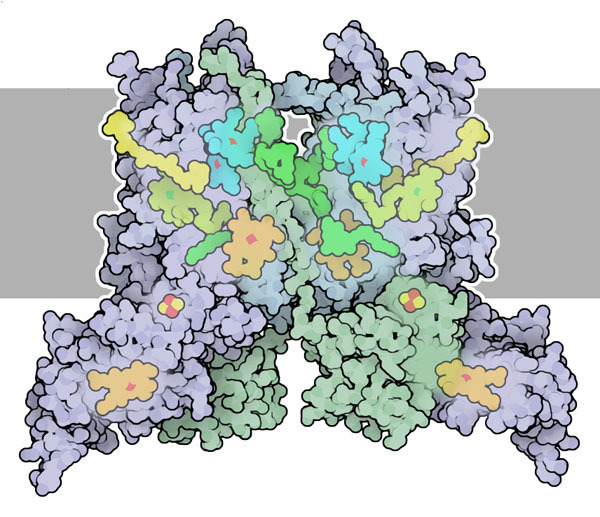 The protons are released on the outer side of the membrane, for use by ATP synthase. The electrons flow down two separate paths--one electron heads down a very favorable path that leads to cytochrome c, and the other travels a less favorable path that leads to the inner side the membrane. There, the electron meets up with another molecule of ubiquinol that has previously lost its hydrogen atoms, and helps it pick up a proton from inside the mitochondrion. The whole thing forms a cycle, termed the Q-cycle, with a pool of ubiquinol molecules dropping protons outside the membrane and picking others up from inside, all driven by the flow of electrons. Cytochrome bc1 is a dimeric protein. Each half is composed of 11 protein chains and a complex collection of cofactors, including several hemes and an iron-sulfur cluster. Structures of several different forms have been determined; the one shown here is from chicken mitochondria, from PDB entry 3h1j ). The structure revealed the location of the cofactors and the two paths that electrons follow. It also uncovered many complex details, such as an unusual motion of the protein holding the iron-sulfur cluster, and scientists are still working out how the entire process occurs without short-circuiting the cycle. Plant cells use a similar electron-driven proton pump to power ATP synthase for photosynthesis. Light energy is used to place protons on a similar hydrogen atom carrier called plastoquinol. Cytochrome b6f, shown here from PDB entry 1vf5 ), then uses these hydrogen atoms in a similar cyclic way to shuttle protons across the chloroplast membrane. The ultimate destination of the electrons is plastocyanin instead of cytochrome c.
The structures of cytochrome bc1 revealed the path of electrons and the sites for binding of ubiquinol, and also a surprise. The path that leads to cytochrome c passes through an iron-sulfur cluster and then to a heme, which then passes the electron to cytochrome c. The first structures showed that the protein chain that holds the iron sulfur cluster flips back and forth, first bumping up against the ubiquinol and picking up the electron, then moving down to pass the electron to the heme. To take a look at this motion, click on the image here for an interactive Jmol. Many drugs have been discovered that bind to the ubiquinol sites in cytochrome bc1. You can find these structures in the PDB, and explore the similarity of the drugs to ubiquinol. 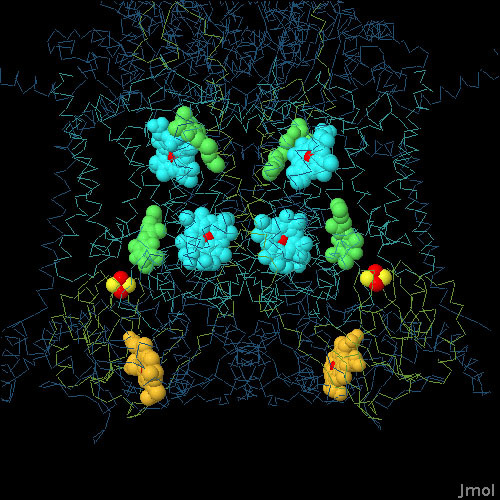 Cytochrome b6f uses a similar mechanism for linking electron transport to proton transport. Compare the two complexes, and notice that cytochrome b6f has a few extra cofactors. Scientists are still sorting out what these cofactors are doing--do you have any ideas?